"Throw Pushkin, Dostoevsky, Tolstoy, etc., etc., overboard from the Ship of Modernity." The simple grammatical injunction ("Throw them overboard!") is here elevated to a grade-a formal topos through which the literary gap between political manifesto and poetry is either narrowed or erased. Needless to say, the first overboard were the paternal improvers of the Russian Nineteenth Century. Rip it up and start again indeed. Yet equally important for the avant-garde as a new direction of travel was the construction of a new mode of travel. Progress as imagined by the nation's forefathers simply wouldn't do. The avant-garde concern with smashing cultural legacy - as opposed to preserving it through radical aesthetic means, a la Elliot or Pound - also explains its great impact on popular culture. So to Kazimir Malevich then. His defining work, The Black Square on White Background, is frequently described in punctuational metaphors: that is, as either exclamation mark or full stop. 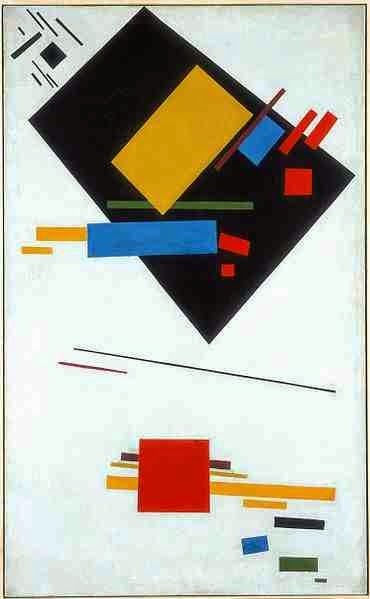 In this sense Malevich's key work of visual abstraction is quite often grasped in representational terms. More accurate than the punctuational image in this case, however, is the aforementioned syntactical one: that is, the injunction of the avant-garde. Black Square amounts to a kind of visual correlative to Mayakovsky's "Throw them overboard." (The pair collaborated in 1914 on, of all things, some cartoon satires of the German army). So imposing is the legacy of Black Square that the Tate has chosen to offset it by screening an off-kilter American staging of the opera which inspired it, Victory over the Sun (the stage backgrounds designed by Malevich). Thus "The Icon" (a pointed title for the room; one Malevich would probably approve of) is relatively marginalised in an exhibition which builds teleologically towards it. In the midst of such distraction (fuzzy Californian accents from on screen Futurist antics puncturing any air of reverence), Black Square can paradoxically be approached with fresh attentiveness. Its world historical importance is not foisted on the spectator by the gallery but rather left to hang dangerously in the suitably cacophonous air. In meta- as opposed to micro-narrative terms, however, the exhibition must be deemed a disappointment. Building teleologically through nationalist agrarianism (Malevich's relatively sentimental attempt to build a specifically Russian visual language of the peasant); to the Franco-Italophile high modernist fusion of Futuro-Cubism; to Black Square itself via Victory over the Sun; and on to the high watermark of Suprematism, the remainder of the retrospective (a startling return to representation, if jarringly surreal where deposited within Stalinist realist forms) is necessarily anticlimactic. 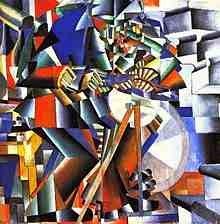 More than this, such rational progress contradicts both Malevich's intentions and indeed his method. Nicely exemplary of this is the simultaneity of styles displayed on separate sides of a single canvas. A mirror reflects a gaggle of Russian peasant women on the back of a more prominently displayed Futuro-Cubist piece. Russian avant-gardism was neither a purely organic or Narodnik agrarian phenomenon nor was it a cosmopolitan emulation of the West but a complex articulation of multiple cultural elements. This simultaneity aside, the moment of Suprematism - surely the big draw here - is inescapably singular. Making up the central section of a circuit of rooms charting Malevich's life's work, the exhibition inadvertently makes one thing clear: the attempt to reintegrate abstraction - especially so violently conceived - into a narrative system of technical and rational development will not work. Similarly with the current Mondrian exhibition at the Turner Contemporary, the staged "escape" of the artist from the trappings of representation into the salvation of abstraction only serves to clarify the unbridgeable divide between the two. Suprematism is supremely historical. The foremost function of art in the age of the avant-garde - at least among its foremost practitioners - was as a socially transformative, even in itself revolutionary practice. Gone were the introspection of Romanticism and the realism of the Victorian era. As Michael Lowy has said, the German-Jewish critic Walter Benjamin - perhaps the greatest radical thinker of his age - engaged in a lifelong critique of liberal and socialist notions of progress. His intention was to map the possibilities of new modes of artistic and aesthetic production which defied the inhuman development of industrial capitalism. Benjamin was, as Lowy argues, equally an anarchist libertarian and a Jewish spiritualist, grafting Marxian historical materialism onto a Messianic framework of human emancipation from the senseless toil of capitalism. The liberal or socialist ideologies of material progress which had dominated the Nineteenth Century - and which reached their material crisis in the First World War - were rejected in favour of new beginnings declared possible in the here and now - the Jetztseiten - into which the world had by chance been flung. Benjamin's thought was of a very avant-garde disposition, one that confronted the extraordinary barbarity of early Twentieth Century capitalism and responded in turn equally radically. Revolution was to be understood not as history's completion, but as an "interruption" of the relentless technological and industrial carnage wreaked by history. Malevich himself called for an equally radical political transformation: the dissolution, he said rather casually, of all rational thought. Easier said than done, you might think. Indeed Malevich's wild political optimism can only be understood if it is placed in the revolutionary social context of the War-stricken Russian Empire. Like Benjamin and other Jewish intellectuals of Eastern and Central Europe, the Russian avant-garde was convinced not only of the possibility of radical social transformation but also of the crucial political responsibility of the artist in carrying it out. Artistic production was conceived as an integral part of the politics of the revolution. But what politics and what revolution? Not, as it turned out, the stodgy, ponderous world of the Second Socialist International and its creaking commitment to the development of the means of production, nor with it the incremental building of proletarian consciousness in the decaying husk of the old world. Breaks would become, as the rhythm of the slaughter accelerated, definitive and completely destructive. The very title Victory over the Sun suggests more than mere Futurist triumphalism but a victory over time itself. The utopianism of Malevich's empty white backgrounds - blank non-places outside of historical time - was the crucial basis out of which the novelty of playful interactions between geometric forms could take place. "Suprematism is the beginning of a new culture," he said, "Our world of art has become new, non-objective, pure. Everything has disappeared; a mass of material is left from which a new form will be built." 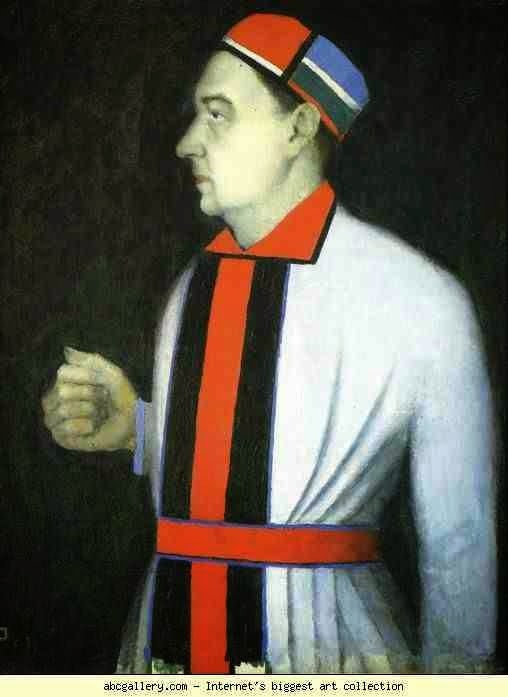 Echoing the Messianism of Benjamin, Malevich even used Orthodox cultural motifs (placing a black square in the position of an Orthodox religious icon in an exhibition) to express the spiritual element of his critique of rational progress. 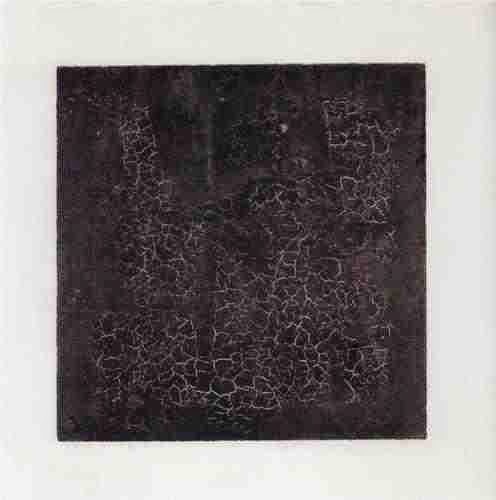 In some cases Malevich was engaged in a meditation on the dissolution of the symbols of the barbarous old world his art sought to break up, as suggested by a series of studies of the cross, slowly fading out of existence. The "interruption" of history (the white background) created a space in which old forms could be dissolved and new elements combined (Malevich's overlapping geometric shapes). In his writing Malevich contrasted what he called the "order" established by "accepted additional elements" with "new additional elements" which arise from new social situations to challenge them. Thus out of the conventional philosophical opposition between movement and rest Malevich builds a theory of aesthetic forms based on revolutionary change. Suprematism is one such change, one of Benjamin's "interruptions": a revolutionary and emancipatory intrusion of the "unacceptable" into the flow of representational forms. New elements gain their strength, Malevich writes, "by deforming and reconstructing the opposing element of the norm which falls under its influence." In the last room of the Tate's Malevich retrospective there is clear evidence of this "deforming" and "reconstructing" of the acceptable by the revolutionary: superimposed over sombre representations of the agrarian peasant world butchered by Stalinism are striking geometric shapes in bald primary colours. Here again lurks the formal injunction, now layered into the old world as a part of its transformed substance. After the Revolution - indeed after Stalinism - the world could not simply return to the status quo ante. However gravely, the revolutionary energy of the avant-garde tunnelled on.